Eight, bright and colourful dinosaurs feature on this extra thick wooden puzzle. The chunky puzzle .. Seven, bright and colourful pets feature on this extra thick wooden puzzle.The chunky puzzle pieces ..
With two different difficulty levels and games on either side, the Spinning Farm Puzzle is a unique.. This Loony Gears Set includes a wooden frame, gears and 5 double-sided templates. A great toy for t..
Mudpuppy's Enchanting Princess Puzzle Sticks includes 24 double-sided pieces that create six diff..
Take home a cute Kiwi Bird Puzzle from Tarata ToysThe simplified shapes of this Kiwi 3D Wooden Puzzl.. This puzzle is made up 6 pieces representing the North and South Island. Each piece is 20mm in thic.. This 5-piece sequencing puzzle has large knobs to make manipulation of the pieces very simple. ..
Three piece wooden chunky puzzle featuring a turtle, octopus and seahorse. 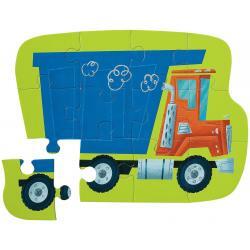 The knobs on each puzzle..
Three piece wooden chunky puzzle featuring a train, car and plane. The knobs on each puzzle piece m.. This shape sorting clock puzzle provides a versatile and fun way to learn to tell the time and numbe.. This lightweight wooden shape puzzle teaches young children to recognise five basic shapes and colou.. This bright, colourful and cute eight piece wooden puzzle from Tooky Toy features a big and small ve.. The natural wooden base showcases the bright two toned colourful letters.Easy to dump out and play,.. This reversible early exploration maze, with 16 moving parts can be played with on either side.One ..
An irresistibly tactile alphabet cube for helping children learn the phonics in a fun way!The cleve..